Santa Monica01263 715779work01603 870304fax Self-cateringYou can step out of this converted fisherman's hut and up and over the dunes directly onto the beach, a fabulous location for a seaside break. The accommodation is characterful and comfortable, and can be used as a base for beach walks, cycling, exploring the coast further along and the Norfolk Broads. • Other: Linen and towels provided, also books and games. • Parking: Private parking for 1 car . Charging point for electric vehicle, standard type 2 socket is available on request. Escape to a refurbished fisherman's cabin for a true seaside holiday. 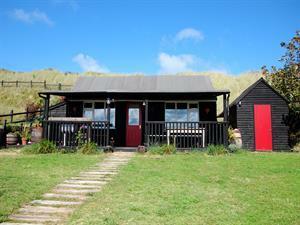 You can step out of this converted fisherman's hut and up and over the dunes directly onto the beach, a fabulous location for a seaside break. The accommodation is characterful and comfortable, and can be used as a base for beach walks, cycling, exploring the coast further along and the Norfolk Broads.